A classic new year target is to shift a few pounds to be more confident and happy within yourself. To move the kayak at 5 mph requires 0.1 hp of effort, which will burn at least 400 calories per hour on average. That means a 2 and a half hour session will burn 1000 calories, or a double Whopper without the sides at Burger King! Kayaking is a peaceful and tranquil experience (most of the time) and as you glide seamlessly through the water, carving elegantly through the gentle sea ripples, your stress will inevitably ebb away as each minute passes. A few wibble wobbles may occur, but it’s all in good spirit and having a laugh while out on the water is bound to make anyone feel better! Whilst out on the waters, your skin will soak up so much Vitamin D, you won’t know what to do with it all! Luckily your body will, as “sunshine vitamin” can be one of the toughest to get from food sources, and we take in over 80% of it through rays…as long as we spend a decent amount of time outside that is. It’s well known that aerobic exercise releases so-called ‘happy’ endorphins that are bound to leave you feeling happy. Whether your depressed, destressed or just need a break away from it all, kayaking allows you to clear your mind and gives you the time out everyone needs at some point. Equally, we imagine kayaking whilst thinking about something that really gets your goat will result in super quick speeds, a fair amount of splashing and reduced negative vibes all round. Overcoming challenges and fears that you may associate with kayaking, no matter how big or small, will leave you feeling tremendous about yourself and your accomplishments. 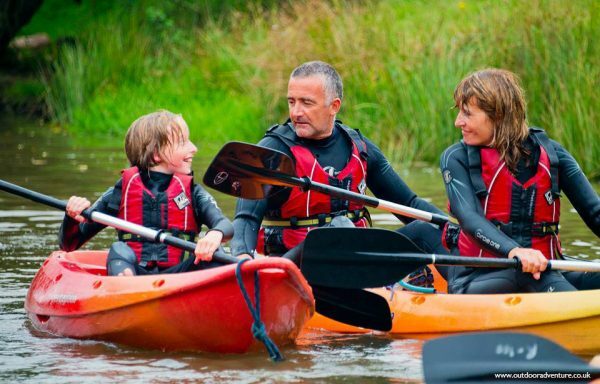 Kayaking, when done as part of a group, is a sociable sport and new relationships and friendships are always a great way to broaden your horizons. The action of paddling a kayak contributes towards your upper body, core and leg strength. No matter your fitness goal, you can’t help but tone up every inch of your body, and you will start to notice a real difference in your physique if training regularly.